After the Belarusian potash company’s fallout with Uralkali, it has lost its sales network and reduced production. Some believe the break-up of the potash cartel was inspired by India and China. With tensions high between Russia and Belarus over the break-up of the Uralkali-Belaruskali potash supply cartel, India has gained an advantageous position in negotiations for a stake in the Belarusian state-owned potash company. Media outlets based in Moscow cited Dr MP Sukumaran Nair, a former Indian bureaucrat and now the director of the Centre for Green Technology and Management (CGTM) as saying in Moscow that India was once again eyeing a 20 percent stake in the Belarusian potash company. This follows years of reports on back and forth negotiations between the Indian and Belarusian governments. Although India has been flirting with the idea of acquiring anything between a 20 and 25 percent stake in the Belarusian Potash Company for many years, talks never progressed beyond a certain stage. But Uralkali’s pullout from a cartel with Belaruskali has put India in an advantageous position. Belaruskali is losing customers, and potash prices are expected to fall more steeply. Belaruskali is considered as the main industrial asset of Belarus. This company is a major supplier of foreign currency to the state budget. After cooperation with Russia ceased, the Belarusian Potash Company actually lost its sales network, since its representative offices in many countries were composed of Uralkali managers. Now Belaruskali finds itself in a difficult position. In late August, Anatoly Makhlay, deputy general director of Belaruskali announced that the company had stopped production of potash ore at two of its four affiliated mine groups, and a significant part of the workforce was placed on two-thirds salary. Last week, President of Belarus, Alexander Lukashenko, said that the republic has representatives at the ambassadorial level in about 50 countries. “Take over and trade potash,” Lukashenko said. “Today, deputy ministers of foreign affairs are travelling to these countries and taking over representative offices of the BPC, in order to enter into contracts and overcome this crisis.” He called on the envoys to work hard. “Today, the disreputable actions of Russian villains gave rise to certain problems with the sales of potash,” Lukashenko said on Tuesday during the appointment of ambassadors extraordinary and plenipotentiary to several countries. “The actions of the shareholders of the Uralkali further complicated the situation in the international potash fertilizers market. Nevertheless, we are determined to normalize the situation. For some reason, I feel confident that the Russians will make the appropriate decision. In addition, the Russian leadership will not leave such a powerful Russian company without attention,” suggested Lukashenko. Uralkali’s chief executive Vladislav Baumgertner was arrested last month in Minsk and the company has appealed to the Russian government for help “The Russians will come to us. At least we do not mind working in such a way that we earn big profits,” said the Belarusian president. 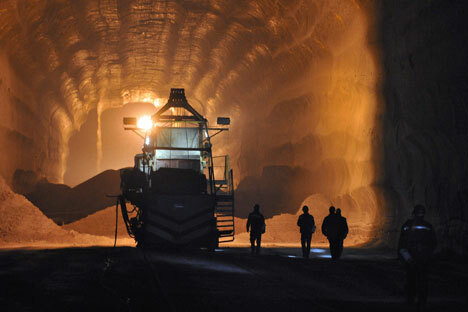 India, along with China, is the world's largest consumer of potash. Earlier reports even expressed an opinion that the Russian-Belarusian Potash conflict was inspired by the Indians and Chinese, in order to bring down the market and reduce the price of fertilizer. In 2011, Lukashenko said that a desire to participate in the privatization of Belaruskali was expressed by India, China, Russia and Qatar, as well as “two Western” companies, which he did not name. Meanwhile, Lukashenko estimated the price of Belaruskali at $30 billion. “The highest bidders will be sold the parts that they wish to buy,” said the Belarusian president, adding that a controlling stake will nevertheless remain in Belarus. At the beginning of this year, Lukashenko said that investors might be sold 25–30 percent of the shares, while 100 percent of Belaruskali was listed as being worth $35 billion. In August, Ambassador of India to Belarus, Manoj Kumar Bharti, said that the Indians are still interested in the Belarusian potash asset. “India is a large agricultural country, and our interest in the potash producer comes from the fact that we are interested in obtaining fertilizer for the least possible cost,” said Bharti. “When the Indians say they are negotiating with Belarus to buy a stake in the Belaruskali, then it is important to understand that these negotiations are not at all with the management of Belaruskali or BPC, and even the Government or its Prime Minister, Mikhail Myasnikovich, have no say in this area. Any such negotiations are conducted solely with the administration of Alexander Lukashenko. Only he makes all the decisions on the fate of the Belaruskali, and no one else,” a BPC source told Gazeta.ru. The Gazeta.ru source noted that these are not the first negotiations of this kind. However, now the situation has changed, and the background of the negotiations is different. According to the source, before investors were offered to buy 10–15 percent of Belaruskali based on $35 billion capitalisation, and as a bonus, the buyer had to invest $2 to $5 billion into certain sectors (usually listed were the most unprofitable segments of agriculture). Yet India considered even such proposals – in the next 15–20 years, according to forecasts, the country’s population will exceed that of China, and so it will need much more food. However, Lukashenko was in no hurry to sell this main Belarusian industrial asset. “Now the situation has changed radically,” said the BPC source. “I think now the Indians have been offered about 20 percent of Belaruskali, and now based on total capitalization of $20 billion.” However, the basic condition of the transaction, according to the source, is that India must guarantee the sale of certain volumes of Belarusian fertilizers.